Illustration by Corina Cudebec UNC’s Renaissance Computing Institute brings academics and industry together to discuss “big data” through a variety of programs including the National Consortium for Data Science, iRods Consortium, and new South Big Data Hub. A handful of middle-aged baseball scouts sit around a conference table to discuss possible recruits for the Oakland Athletics. The room is quiet, their breathing barely audible. One scout spits tobacco into a cup. They’re patiently waiting for Manager Billy Beane to pick a player. Finally, he offers up three names — but none of the scouts are impressed by their reputations. The gut feeling isn’t there. But the numbers are. An analyst in the corner pipes up that three ballplayers with a 364 on-base average will improve the team’s chance at winning the most consecutive games. Most of the scouts throw their hands up in the air frustrated. RENCI views the consortium as an extension of its role to serve as a research accelerator for communities of scientists across institutional boundaries. Today, NCDS brings together researchers and businesspeople alike from a variety of institutions including IBM, General Electric, Drexel University, NC State, the Environmental Protection Agency, and RTI International, to name a few. Throughout the year, the consortium hosts a variety of conferences, a short course series, and the Data Fellows Program — an early career seed grant program for junior faculty conducting industry informed research. While security is a big issue for some, the economic value of such devices is a draw for others. One local startup, for example, has developed a grain sensor that tracks the moisture within a silo. The data collected tells farmers when the grain will spoil and helps them decide which silos to empty first. Agriculture — another traditionally gut-driven industry — could benefit greatly from data science, according to McKeen. “At a conference last summer,” he says, “one presenter touched on using data and GPS to run tractors, to decide where to put fertilizer, and how to get more yield from crops to help lower the price of food. He wants to solve world hunger using data to make the land more efficient — not just in the United States but globally.” Every industry uses data, but the big players are financial services, health care, utilities, and manufacturing. RENCI already has a solution for that: iRODS. Short for Integrated Rule-Oriented Data System, iRODS is an open source data management software that allows research organizations and government agencies to store their data, attach metadata to it, automate policies for managing it, and make it discoverable. Coposky leads the iRODS Consortium, a collaboration similar to NCDS that offers support to users. Some of the software’s biggest clients include life science and genomics institutes like the Wellcome Trust Sanger Institute, Complete Genomics, Bayer, and even NASA. Researchers in these organizations can actually transfer the data observed by scientific instruments directly into iRODS. In truth, the software is for any organization that has a large amount of data to manage, according to Coposky. So far, the consortium’s other members include universities, information technology businesses, and data storage companies. In 2015, the National Science Foundation (NSF) established four regional hubs to accelerate the emerging field of “big data” science. Today, UNC and the Georgia Institute of Technology manage the southern region of that initiative, the South Big Data Hub (South BD Hub). Each hub focuses on different “spokes” to address regional challenges. South BD Hub has five: health care, coastal hazards, industrial big data, materials and manufacturing, and habitat planning. Industry collaboration will play a large role in the communities Ahalt references. In fact, NSF has publicly stated that it would like all its data hubs to be a place where public-private partnerships can form. Such relationships began developing this summer with the creation of the Southern Startup Internship Program in Data Science (DataStart) — the brainchild of RENCI’s Knowles. Funded by the Computing Community Consortium, the program paired six graduate students from universities throughout the South with new and growing technology companies. For three months, each student helped their assigned startup address data-related business problems. When groups share and combine their data, they unlock new knowledge, according to Ahalt. 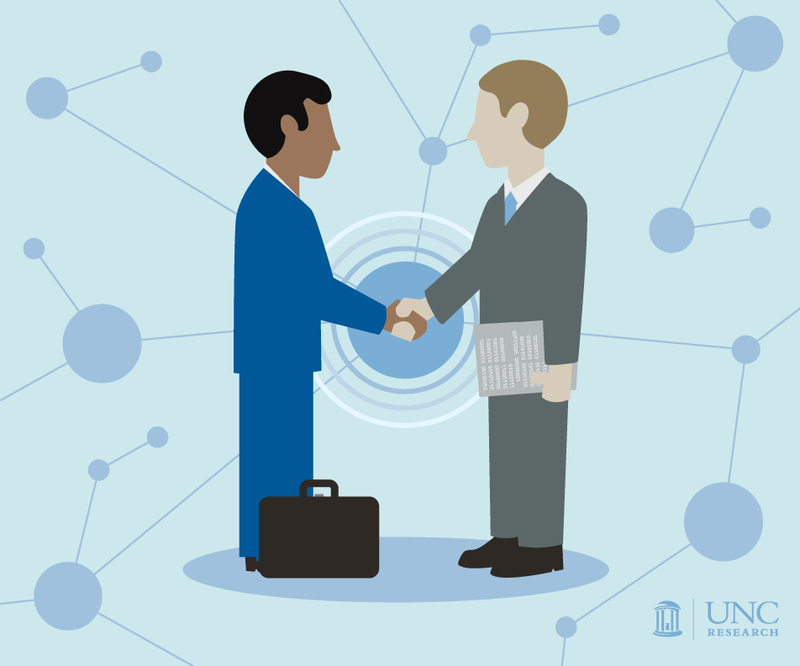 The North Carolina Translational & Clinical Sciences Institute’s (NC TraCS) Carolinas Collaborative, for example, gives a group of North Carolina and South Carolina health care systems access to each other’s data. This allows them to do things like compare the number of patients with a particular disease and the medications their taking — information that can advance research and improve the quality of health care. “We can also take data from sensors on the ground to record how fast it’s raining in Eastern North Carolina and combine that with data from satellites and airborne vehicles to identify how significant storm surges would be in coastal regions,” Ahalt explains. This information could then be integrated into UNC-developed ADCIRC, a powerful computer model for predicting the response of the coastal ocean to tides and storms. Shannon McKeen is a faculty advisor and adjunct professor within the UNC Kenan-Flagler Business School and a consultant for NCDS. David Knowles is the director of economic development and regional engagement at RENCI. He also leads program development and operations activities for NCDS and was part of the team that developed the iRODS Consortium. Stanley Ahalt is the director of RENCI, a professor of computer science, and the associate director of the Biomedical Informatics Service for NC TraCS. Jason Coposky is chief technologist and interim executive director of the iRODS Consortium.